Perry Ellis Suit Sale. Suit jackets on sale for $69.99 and suit pants on sale for $29.99. Add one of each to cart, only $100 per suit set. Shipping is free. Tax in most states. 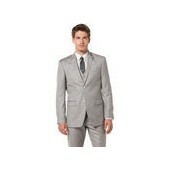 Linen Blend Textured Suit Jacket (pictured) only $69.99 (reg.$185).